This unique 1-day ecotourism tour takes you past Fuguo Monastery, one of the five most important Tibetan monasteries in Lijiang, before reaching the remote Yi minority Snowflake (Xuehua) Village, where you can have a chance to visit a traditional Yi household. The Yi are one the largest minority groups in China and the largest group in southwest China, occupying rural mountainous areas of the region. Known for their colourful costumes, they have their own pictorial language and are fiercely proud of their culture. A short drive later we will reach Wenhai Village, a pristine Naxi village located at 3200metres next to the beautiful seasonal Wenhai lake. Here you will have a chance to walk around the lush Wenhai meadow and enjoy a local lunch with a Naxi family. The day ends with a visit to the ancient Baisha village, some 1200 years old. We will try to visit the famous herbalist Doctor Ho and the Naxi Embroidery School. Nestled in a sub-alpine valley at an elevation over 3000 meters, and inaccessible until recently except by foot or horse, Wenhai provides a perfect setting for exploring the traditional cultures and natural attractions of Northwest Yunnan. With Wenhai lake in the foreground and Jade Dragon Snow Mountain towering in the background, the tranquil Naxi village of Wenhai makes for a pretty sight, especially in the rainy season (May to August) when its lush banks are covered with splendid blooms of wildflowers and primroses. 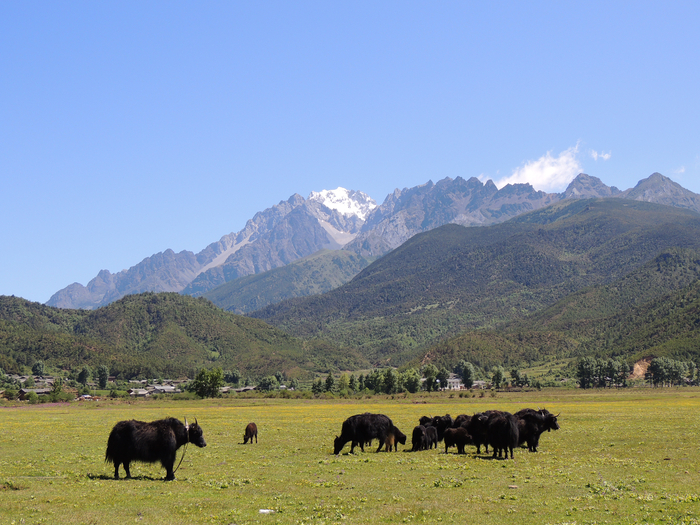 Enjoy a relaxing walk in the meadows of Wenhai and watch alpine animals such as yaks, miniature horses, black pigs, goats and sheep grazing. A relatively easy hike that takes you from Upper Wenhai village with barely 100 households (3200 metres) down the slopes of Jade Dragon Snow Mountain to the Lijiang Valley, at 2800 metres. Along the way, you’ll pass lush alpine forests, a reservoir, the highest botanical gardens in the world, hundreds of varieties of vegetation including fir trees, wild flowers, mushrooms and herbs, before descending to Yuhu, the last village at the foot of the Jade Dragon Snow Mountain, a remote stone village best known for being the home of explorer Joseph Rock for over 27 years. For the relatively fit, this trip allows you a different way of experiencing the splendor of the Lijiang highlands. The hike up the slopes of Jade Dragon Snow Mountain will take you from 2700metres to over 4650meters, passing Fuguo Monastery, the Lijiang Alpine Botanical Gardens, pristine alpine forests, and Wenhai meadows along the way, before ending at Baisha Village. If you have any questions at all regarding The Bivou, our packages, or adventures around Lijiang, feel free to email us at ask@bivou.com. We'd be happy to help!